The script file "D:\Dev\GIT\AHK\lintalist\tmpscrpts\tmpScript.ahk" does not exist. Create it now? Could not create file, perhaps because the current directory is read-only or has insufficient permissions. 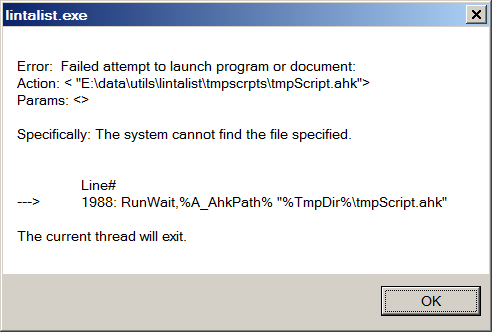 I receive "tmpScript.ahk not found" error when running a Lintalist.exe that I have compiled, but no error when I run Lintalist.ahk directly. The error occurs when trying to execute a text shortcut for a Lintalist entry in a bundle that is triggered by a window title. That is because Lintalist.ahk isn't meant to be compiled as such. If you are running lintalist.ahk (or lintalist.exe provided in the ZIP download, which is simply a renamed autohotkey.exe) it uses AutoHotkey to run scripts. If you compile the script and AutoHotkey isn't properly installed on the target computer it can't run scripts as there is no autohotkey.exe present. For compiled scripts: The same as the above except the AutoHotkey directory is discovered via the registry entry HKLM\SOFTWARE\AutoHotkey\InstallDir. If there is no such entry, A_AhkPath is blank. I never took into account for lintalist.ahk to be compiled so apart from it not being able to run scripts in some situations, there will be other parts of the script that might not perform as expected. I will not prepare or modify lintalist.ahk for it to be compiled. OK. Thank you for explaining. I have installed AH properly, but it is just portable and not installed through the installer. In any case, I will just run Lintalist as a AHK file. It is a handy program!